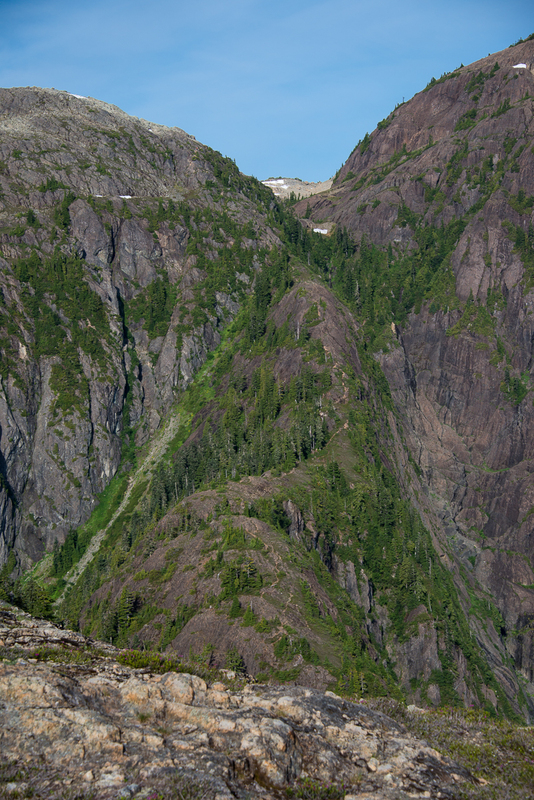 Don’t let what you see on the Island Highway fool you: beyond the trees that border the highway, Vancouver Island is densely populated with hundreds of peaks that reach over 1000 metres of elevation. If you follow my blog, you know that I have the lofty goal of summiting every peak (some 292 of them) described in Philip Stone’s Island Alpine. This goal will keep me busy in the backcountry for years to come! 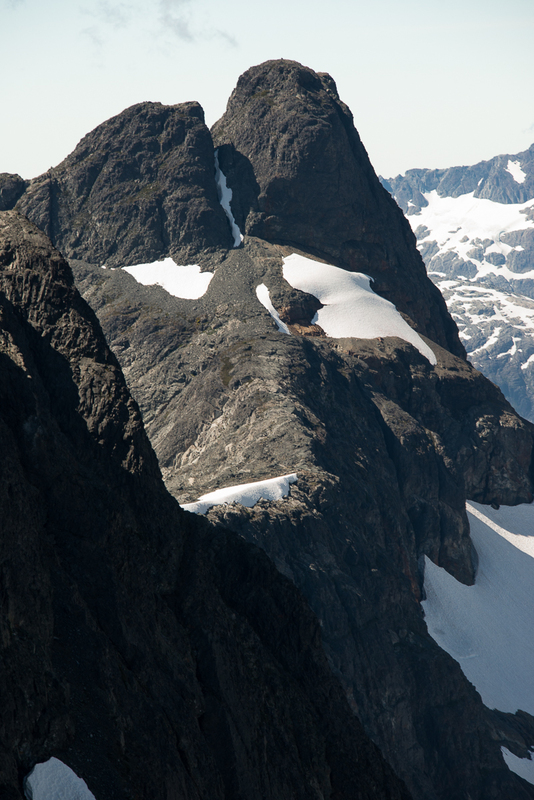 Before I started my mountaineering adventures, I didn’t give much thought to the mountains of Vancouver Island. Of course, I recognised a few of the obvious ones – like Mount Benson, Mount Arrowsmith, and Mount Washington – but the others were really just bumps that I didn’t give much regard to. There is one notable exception, however: Comox Glacier, the great white whale in the mountain! As a child, I would look for the Comox Glacier whenever I passed Comox. The huge, white feature spans the top of a tower of rock. The feature is so prominent on the skyline that the large mountain it rests upon doesn’t have an official name, but is known simply as the Comox Glacier. (I won’t use the mountain’s unofficial name here, in order to honour the significance of the glacier.) The glacier has played an important role in the cultural identity of the region; the BC Geographical Name Search has a synopsis of the rich First Nations narrative about the Comox Glacier. Needless to say, I have longed to visit the glacier. Unfortunately, accessing the glacier presents some logistical problems. The best months to hike the easiest routes are in the summer, and the easiest routes are behind the Comox Mainline gates. For years, however, the gates have been locked throughout the summer, to protect the private forestry land and equipment. But in 2015, TimberWest began to allow weekend recreation access, dependent on the fire season. This change opened up a wide variety of options for all hiking enthusiasts! 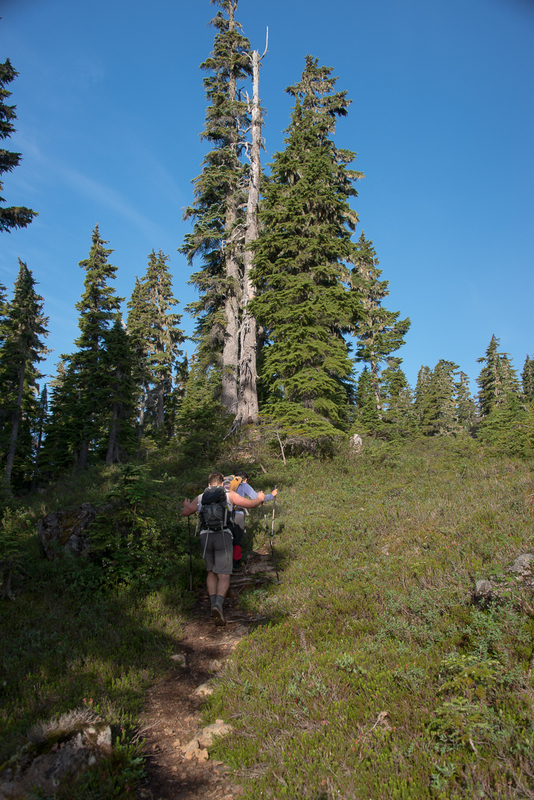 On August 13th, I joined a group of Island Mountain Ramblers on an epic dayhike to Comox Glacier. For Phil and me, it was the second attempt to reach the glacier; last year, we tried hiking the first ascent route. With overnight gear, the route proved too long and hot for us, and we didn’t make it. Although we didn’t achieve our objective that time, the trip still stands out in my mind as one of my favourite alpine routes for hiking and camping. This time, we planned to use the standard approach: the Frog Ponds route. We would finally sit on top of the whale! We arrived at the trailhead late on Friday night, with darkness falling as we set up our tents and crawled inside. As I drifted off to sleep, a mild anxiety washed over me. Although I was cautiously optimistic about doing the Comox Glacier in a day, my friends who have done the route before told me that we were being ambitious. Usually, the Frog Ponds Route is done as a multi-day trip; the first day is spent gaining the elevation from the trailhead to the frog ponds on the ridge, and the second day is used to summit, before returning to the trailhead. To do it in one day, we would need to give it our all! Thanks to waking early we were walking the trail by 6:15 am: early enough to give us a head start on the heat of the day, and late enough that we didn’t need headlamps to walk. Frog Ponds is a longstanding and popular route established as early as 1963, as is noted by the trail sign we discovered while hiking. The trail is exceptionally well-booted and trimmed, and even though it has very few trail markers, it’s easy to follow. As we hiked, I thought about the significance of the date on the sign: it’s a reminder of the efforts of the women and men that originally built, and continue to maintain, the trail. We moved fast, as our packs held nothing but water, food, and a good jacket. Though each of us used hiking poles, we left our ice axes and crampons in the truck; the leader’s research promised that we would have no need of them on this trip. The lowest section of the trail passes through forestry land and up a series of steep switchbacks, most of which are well-planned. The biggest challenges are the numerous steep sections where the decades of traffic have scraped off the soil, leaving exposed rock. In these places, convenient handlines helped us ascend safely. We climbed the north-facing slopes easily, and reached the beginning of the long ridge (1300m) before 8:00 am. Reluctantly, we took a break to catch our breath. Our reluctance was due to the ferocious mosquitos: there were as many as 30 of them sitting on my hat! I was grateful to be out of the woods and on the ridge, where we caught the occasional cool breeze; deep in the forest, the air was muggy, still, and bug-infested. It was a delight to have clean dry air in my lungs! Mary led us on a steady pace westward along the ridge. As we walked, we could see our goal looming, just beyond a deep valley. We walked closer to the cliff edge, admiring the view of Century Sam Lake far below. Even though it was in the shadow, deep in the cirque between the Frog Ponds Ridge, Comox Glacier, and the opposing ridge, the lake practically glowed like a radioactive pond. The Frog Ponds approach to Comox Glacier traverses east along the long alpine ridge via a well-booted pack trail. I was grateful for the clear day, giving clear views of the surrounding ridges, including the ridge that forms the first ascent route past Tatsuno Lakes. The challenge of the Frog Ponds route is in the descent off each of the two bumps, before ascending the east ridge toward Black Cat Mountain. The descents are steep gullies that drop as much as 100 metres to saddles below. I approached the first drop-off tentatively, worried that the dry conditions would make the steep descent more difficult. Fortunately, the decades of traffic on the trail have stripped most of the loose dirt and rock from the slopes, and the dry conditions and fixed handline made the descents easy. By 10:00 am, we were sitting in Lone Tree Pass (1504m) enjoying a drink of cool glacial melt-water coming off Comox Glacier. As I sat in the saddle, I looked back toward Black Cat Mountain and wondered how long it would take to ascend to its summit. I had no intention to hike up to the summit, but I do have an itch to say that I’ve hiked the full first-ascent route! As we munched on our snacks, we also examined the route ahead. Although from a distance the route looked challenging, from the base of the final ascent we saw that the route was simply a steep hike up through a bushy gully to the easy slopes above. 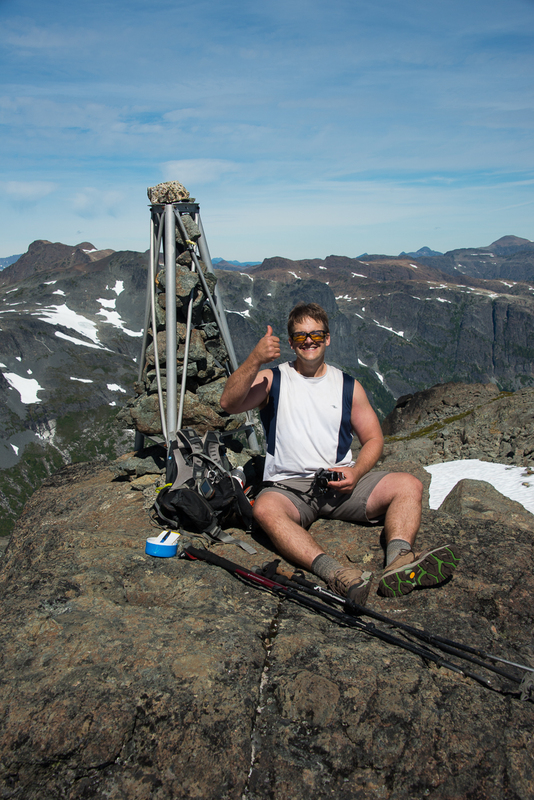 It took us very little time to reach Comox Glacier’s southwest summit (1845m). We stood and marvelled at the path along the glacier to the summit on the other side. The surface was consolidated seasonal snow, with only small patches of the exposed blue glacial ice. 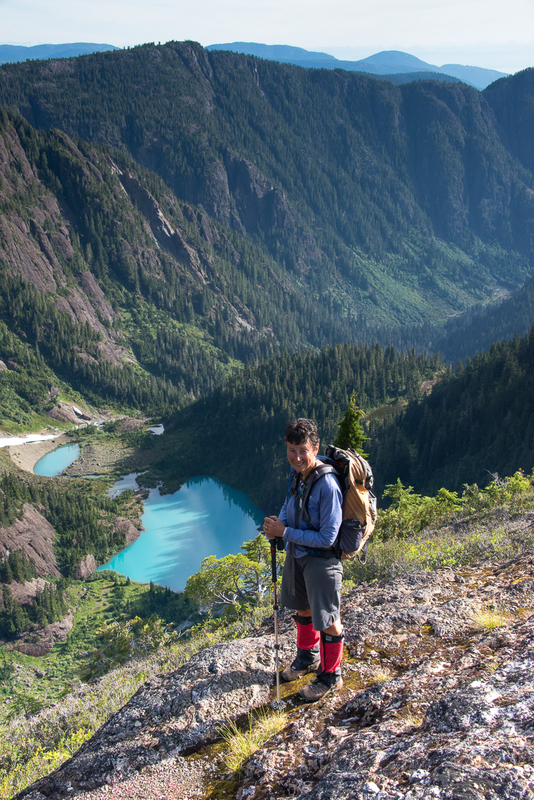 I’ve walked on a few of Vancouver Island’s notable glaciers, including the Upper Rugged Glacier and Big Interior’s Glacier: each of those glaciers has challenges to overcome, requiring the use of crampons and careful navigation to avoid crevasses and moulins. Comparatively, the Comox Glacier is a walk in the park! 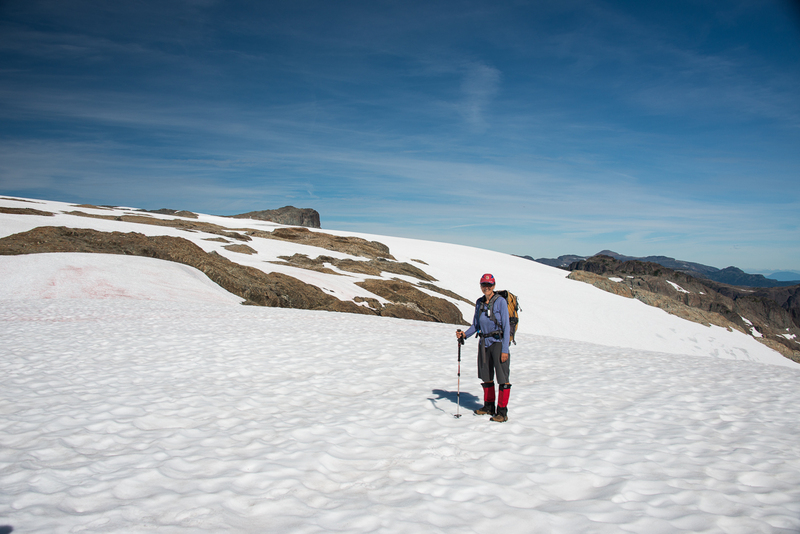 The upper section of Comox Glacier is more like a snowfield, flat and obstacle-free. As we walked it, I was happy to see that there wasn’t more exposed glacial ice; this makes me hopeful that we won’t lose the glacier! The surface was soft enough that crampons would have been useless. We quickly crossed the glacier toward the north summit (1965m). As we crossed, I could see two figures standing at the summit; in time, the two figures descended and we met at the base of the short hill that leads to the summit. We didn’t spend much time talking, because each group had an agenda to follow, but it’s good to have a chat with everyone you pass in the backcountry. We arrived at the north summit at 11:15, just five hours from our start! We were all surprised – I had certainly expected a much longer day. As I stood on the summit, I was confused. I looked to the north at the land features beyond the Kweishun Valley: they looked so foreign. I had walked that area just a few weeks earlier. In June, the valley was covered in snow and ice; now, it was transformed into a barren, rocky landscape. I expected to see at least some snow, particularly on the Aureole Icefield, but perhaps it was hidden from view. Rees Ridge was also barren, and so were Iceberg Peak, Celeste, the saddle between Comox Glacier and Mirren Lake, and the steep slopes from Rees Ridge down. I also looked to see where we descended from Iceberg to the Mirren Lake. With its exceptionally steep scree slope and small cliff band, it was definitely not something I would descend in the summer! I also noted that it looked like we had taken the stupid route down! Because we had such and easy and fast ascent to the summit of the Comox Glacier, we didn’t feel guilty when we spent almost an hour there. We took photographs, ate our lunches, and examined the surrounding landscape. I enjoyed it. On our return, we passed scores of people – some heading to the glacier, others just camping in the alpine. I was surprised to see so many! The Comox Glacier would see 14 people summit on the day we made the trip, and likely that many more the following day. I have to consider that these numbers are because the logging road has been repaired, and people are rushing to get in before the gates are locked again. I was pleasantly surprised with our time. We kept a steady pace, but we definitely didn’t rush, and we easily made the trip in a day. I was also surprised to see that the trip stats are less than many of my other long daytrips. Based purely on the numbers, Mount Idsardi, Mount Albert Edward, Mount Regan, and others are all more intense. If you are getting into mountaineering, consider making a trip to the Comox Glacier before it’s gone. 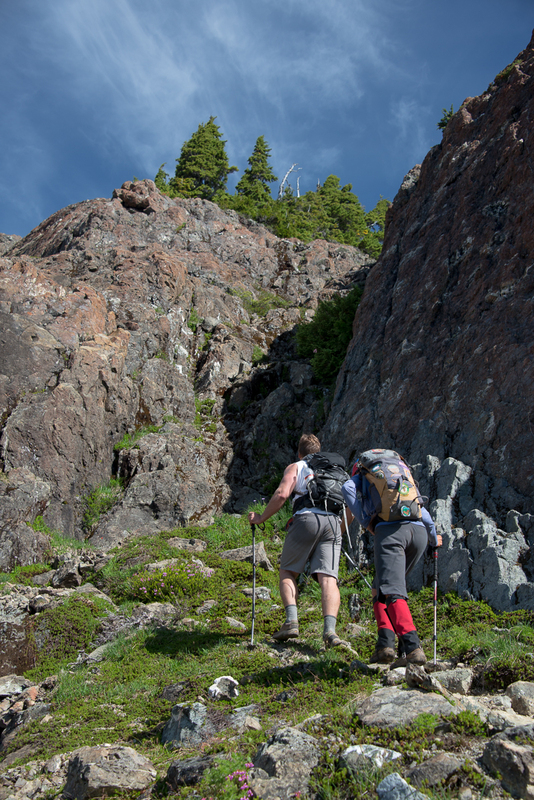 Mostly it’s simple hiking, but be ready for some steep gullies! See more photos from this trip!